* Update Note: The engine was sold to repower a Santana 30 in Pudget Sound, Washington. 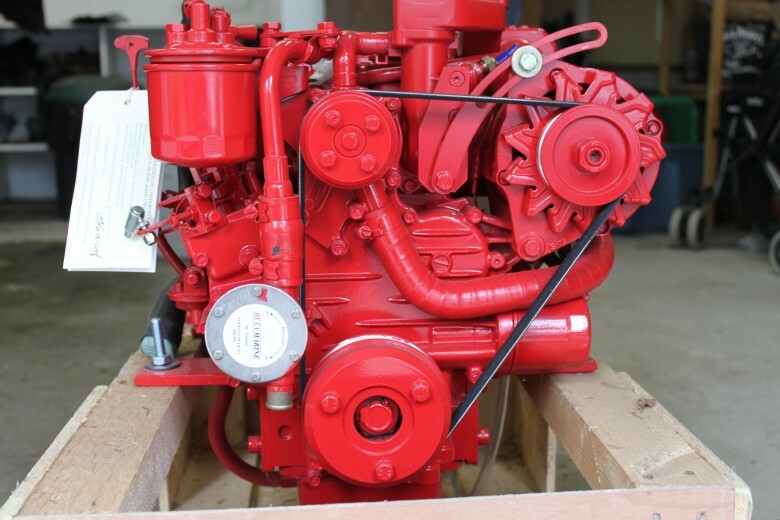 Beta Marine, based in England, marinizes Kubota [Japanese] industrial diesel engines. They provide a wide range of engines, all based on the rock-solid Kubota engine core. The engines are used in a wide variety of applications including repowering, new boat manufacture, sailboat, fishing vessels and trawlers. Easy Oil Change – Beta Marine recognized the oil change problem years ago, and offers an oil change pump mounted on the engine and plumbed to the low point of the oil pan. To perform an oil change, just open the valve at the base of the pump, remove a small cap at the pump discharge, and operate the pump with one hand. Unlike the cheap hand pumps we are all familiar with [and disdain] the Beta Marine pump is all brass, high quality, works easily and very efficiently. Easy Maintenance – Beta puts all the components that need to be serviced right at the front of the engine. Full Warranty – The engine is under full warranty until it is installed. Beta also offers access to highly trained professionals to address installation questions and assist with installation if necessary. Half Float Valve Cover – More Comfort from Less NoiseIn order to improve the already well-established lower noise levels of the existing engines, Kubota added a half float head cover, and a MoS2 coated piston to these engines.The rubber ring seals and isolates vibration and reduces the noise from the crankcase. As a result, the noise level is 1.0~1.5dBA lower than that of the conventional models in the same class. High Output Alternator – 70 Amp Iskra alternator is very efficient and produces high output at low engine rpm. They can feature a split charging system, so 2 separate battery banks [such as house and engine start banks] and can be charged at the same time. Also available is the “Beta controller,” that is the automatic “smart” type, to charge your batteries at the most efficient rate. This system automatically adjusts the charge mode to suit battery load, which ensures maximum life for your batteries. High Rise Exhaust Elbow – Allows for engine to be placed very low in boats and still insure no water will flood back into engine. Kubota’s Proprietary E-TVCS (Three Vortex Combustion System) – This system allows for drastic emission reduction. It obtains an optimum air/fuel mixture by generating three intense swirling air flows (vortexes) within the spherical-combustion (swirl) chamber. produces far less soot, HC and CO thanks to a better match between the injection nozzle throat and the concave recess on the piston head. E-TVCS meets all applicable emissions regulations world wide.The injection pump and nozzle are better matched with the combustion chamber to reduce NOx emissions. Fuel Efficient – Uses less than .2 gal. (1 L) per hour when running. Inexpensive to Operate – Low maintenance and repair cost because the engine is based on a tractor engine. Spare parts are easy to come by. MoS2 Coated Piston – Sulfureted molybdenum coating enables clearance reduction between the piston and the cylinder liner, thus optimizing the oval shape ratio and decreasing the piston slapping noise. Reliability and Longevity – Based on Kubota’s original sturdy design, the engine promises great reliability and long service life. These engines have an excellent reputation for high horsepower to weight ratio, longevity, smooth running, and low emissions. They are the most technologically advanced small diesel engines available today for marine applications. Quick Start ups – Super glow system comes as standard equipment to shorten preheating time and quicken engine start up in cold temperatures. Many standard mount options including Atomic 4, Volvo, Albin Vega, etc. Shipping can be arranged. If you are a ~400 mile radius, I may be able to deliver for discount rate. I am offering a $2,000 discount and selling the entire engine package for $6,500. I’m interested in the discussing the Beta, if it’s still available. Thanks. I am considering re-powering my Hunter 27 with a 10HP or 14HP Beta marine diesel, but I can find no info as to pricing. From your post, is the retail price about $8500 for a 14HP? Appreciate your info. I believe that is correct. I’d have to double check my invoice to say that with 100% confidence though and I can’t find it right now. I purchased back in 2009 – 10, however, so prices have likely gone up now. My suggestion is to reach out to your local Beta dealer. If you don’t know who that is, you can call Beta and they’ll tell you. If you’re in the Pacific Northwest, give Ben Thomas from Oregon Marine Industries a call – 503-647-0009. He’s (one of) the Beta dealer in this area.